Courtesy of Arianna Aloia/ Island Waves. Izzy celebrated his 15th birthday this year. Even though there was no official announcement about his change of skin color, recent Izzy is noticeably whiter than earlier editions. TAMU-CC didn’t have a walking mascot for decades. I met with Shelby Gonzalez, Library Specialist II in Special Collections, who informed me that TAMU-CC was first created in 1947 under the name of Arts and Technological College (ATC). That fall, the college moved to Ward Island and became the University of Corpus Christi (UCC) and chose the tarpon as their mascot/symbol. After visiting with Gonzalez, I became inspired to start digging through Island Waves’ extensive archive, starting all the way back from our publication’s beginning in 1993. 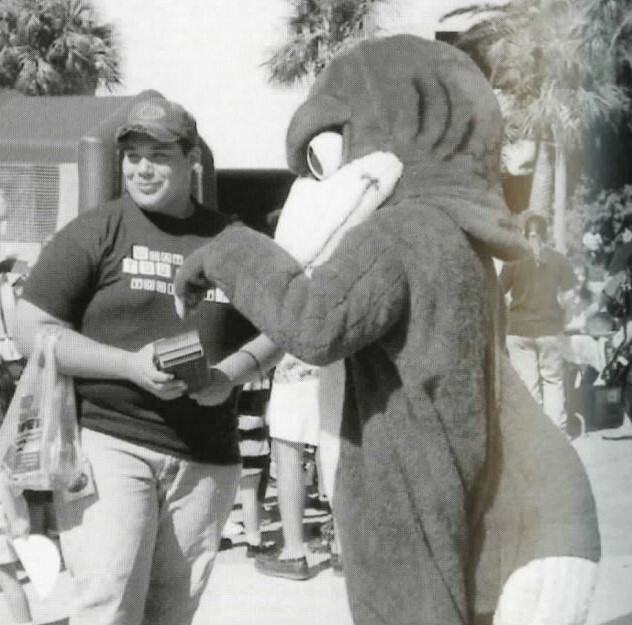 I scoured through dozens of articles, trying to search for an image of this supposed tarpon mascot. That’s when I found an article published on Aug. 31, 1995 asking for students to submit designs for a new mascot, offering a $500 cash prize to the winner. This is where the interesting and complicated story of our mascot begins. Ultimately, the contest winner designed a scowling tarpon in a sweater, but this was later changed by the design company Morehead, Dotts and Laporte. 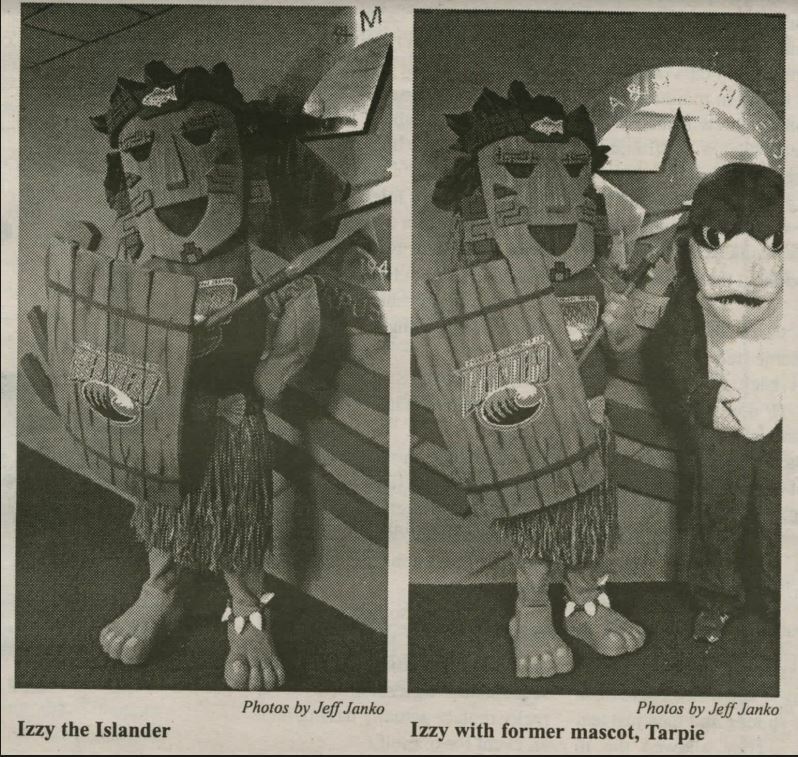 After a meeting between the Mascot Advisory Committee and the then TAMU-CC President Robert Furgason, it was decided that the mascot would be called the Islander and the Islander would represented by a tarpon. Seems like everything was put to bed, right? Nope. Months later, the new mascot hadn’t been released and people still voiced their concerns, the most prominent being that the new mascot looked too masculine. 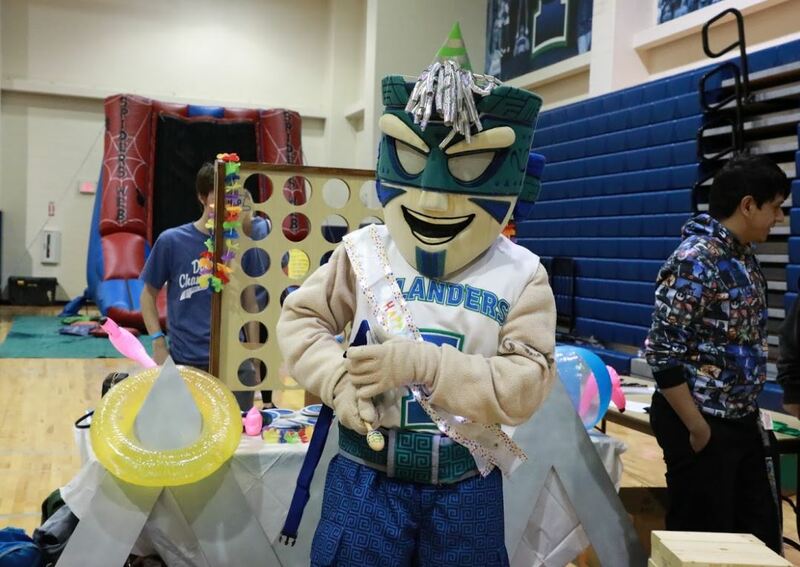 But by the time the last meeting between the Mascot Committee and the president occurred, everyone was comfortable with the new tarpon mascot. The tarpon made its debut on Nov. 13, 1997. It was several months before students were chosen to don the suit, and it was even longer before the mascot was given a name. It seemed that students just started calling it “Tarpie” and the name stuck. So, what happened to this loveable, sharp-toothed fish? Why was Tarpie changed to Izzy? It’s simple, really: branding. 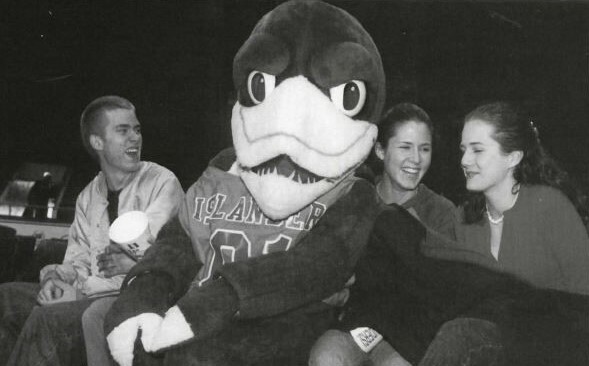 On Oct. 21, 2004, Jo Anna Benavides-Frank, the then Assistant Director of Student Activities, said, “People weren’t recognizing what the mascot was.” I mean, who could blame them? Tarpie did just look like a scary, bird thing with blue fur, angry eyebrows and weird flipper feet. Did they have to completely change the mascot, though? And to a completely different mascot who was sporting a shield, spear, grass skirt, tooth accessories and tribal mask, to boot? That’s when I found an article from 2010 that dived a little deeper into the thought process behind Izzy. Later, this orange, testosterone fueled character, that clearly is a reference to a Pacific Islander, was phased out with the whiter Izzy that we all currently see at campus events. There was no official announcement of the “revised” Izzy. My pursuit for more information left me feeling unsatisfied and questioning more. It seems that the only reason why Izzy was created was to fulfill a corporate need for a more streamlined appearance and easy recognition. Why we had to appropriate bits and pieces from the Pacific Islander culture that has nothing to do with South Texas, besides advertisement, is beyond me. Why were we so concerned with appearing to be a party school while not worried at all about cultural appropriation? And why was tangerine Izzy changed to white Izzy? I think it is time for the student body to question if Izzy accurately represents the entire TAMU-CC population. Of course, some would argue that Izzy is now ensconced as our mascot and is all in good fun. I say Izzy is an outdated representation and is the exact definition of cultural appropriation. It’s time for a change. Izzy does represent TAMUCC really well. It is not about the color of his skin. It is about his fun loving “island vibe.” Way too much is being made out of this. Izzy and all mascots are branding tools to try and promote the universities. There is nothing wrong with that. An “accurate” representation of the student body has nothing to do with the mascot. Are A&M’s students all dogs? No, mascots are all about creating a brand image, and Izzy does a great job of that. Thank you for sharing your thoughts! We have taken all responses into consideration and continued the story henceforth. Our writer has expanded upon their thoughts on this subject in our latest issue of the newspaper, if you’d like to see the conversation continued please do pick up any of our papers on campus and keep a lookout for more about the Izzy conversation here. 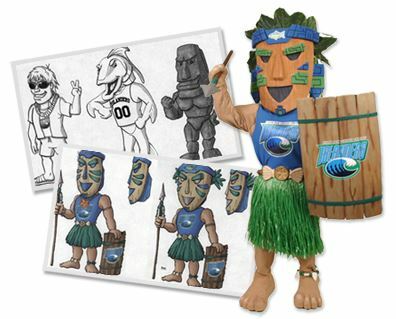 What would you suggest be a representation of the new mascot for TAMUCC? A girl looking like a hula dancer? A boat captain? There’s only so little to choose from while still being able to please the city of Corpus and the students/faculty of TAMUCC present and future. 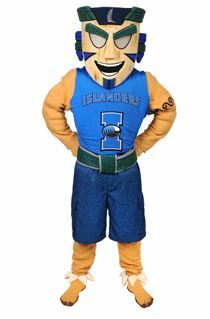 I think people still find Izzy the Islander appealing, and overall if you think about TAMUCC you think about someone as yes random but different as he is. We’ve heard students suggest another animal (like a snapping turtle, or a type of bird) native to Corpus Christi! This is a very complex and not easy to enforce situation, however, we love to hear all the ideas and suggestions and also appreciate those who already adore and enjoy Izzy. Thank you so much for your contribution to the conversation we have taken all responses into consideration and continued the story henceforth. Our writer has expanded upon their thoughts on this subject in our latest issue of the newspaper, if you’d like to see the conversation continued please do pick up any of our papers on campus and keep a lookout for more about the Izzy controversy there.